Why Do You Need To Anticipate Change? Being able to anticipate that which is likely to occur in the nearest or remote future gives you an edge over others who simply go along with whatever happens. Change represents an opportunity for your business and it must be anticipated and prepared for. Foresight and change anticipation is a hallmark of effective leaders. Technology, radical innovations, new business models, globalization, demography, consumer demands and choices all contribute to making today’s society one of accelerating change. The drivers of change are numerous and complex, and their impact varies from one sector to another. Adapting too late or too little can result in disaster for your business. If you wish to avoid a long and painful adaptation process you must improve your capacity to anticipate and prepare for future change at the earliest interval. Using foresight and anticipation to envisage possible future scenarios is the first step in preparing for change and managing it successfully. There is big difference between anticipating and guessing. Anticipation means expecting, being aware of something in advance, to regard it as possible. 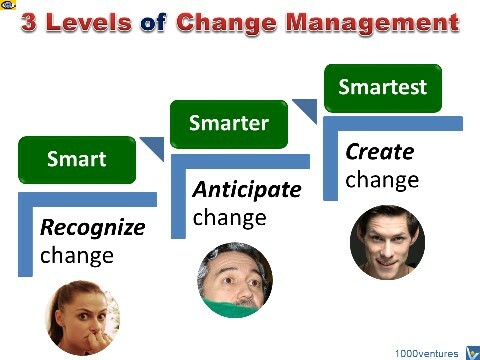 The ability to anticipate is one of the key ingredients of efficient speed and → change management. "The further backward you look, the further ahead you see." How can you see the future? Actually, anticipation is natural – everyone does it every day. Paradigms provide a basis for anticipation of specific events. Unfortunately, most people limit exercising their anticipatory skills to daily routine matters. All you really need to start applying these skills for your business is a small head start. Intuition is a form of → unconscious pattern-matching cognition. Preparation and incubation precede flashes of insight. Understanding of how something works, partially consciously, allows you to anticipate and predict occurrences that are then subsequently explored very consciously.2 "Hutches" occur to the prepared of mind. see change as an opportunity – not a threat.